The first thing you notice is that the white heart has beautiful gold tone charm attached to the top. The year 2014 is inscribed on it and the phrase Our First Christmas runs up the right side. A snowflake design is embossed on it. A rhinestone is placed in the center of each snowflake. Hallmark is known for its beautiful and sentimental Christmas ornaments. This white heart ornament is one of their best. 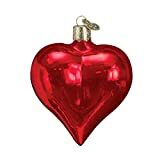 A vibrant red heart glass ornament will stand out on any Christmas tree, whether it's dark green, crisp white or sparkling pastel pink. It will show that you're a passionate person with lots to live for. It's also a beautiful shape all on it's own - if you take away the emotionalism. But why would you ever do that? You can opt for a bright and shiny heart-shaped ornament that will reflect your Christmas lights perfectly. You could also choose a matte brocade and embellished heart. You don't even have to choose, because it's certainly okay to load up your Xmas tree with lots of love and romance. Proclaim your love for your husband. Heck you can add I (Heart) My Dog or I (Heart) My Cat as well. Hallmark is one of the most beloved All-American brands. For generations women have chosen Hallmark cards as a way of showing how much they care. They've also been decorating their Christmas trees with Hallmark Christmas ornaments. If you're a guy and you want to impress your girlfriend, wife, mother or sister, just know how much the Hallmark brand means to them. Ebay is a fantastic Christmas ornament store. You'll find hundreds of Hallmark ornaments to choose from. You'll have all kinds of heart-designs to choose from. 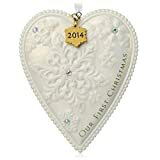 For example, there's the Mother heart ornament with the year on it. Perfect for when a woman becomes a mother. 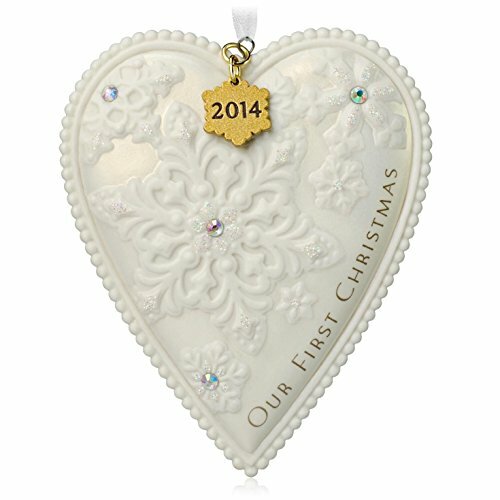 There's a beautiful hand-embroidered heart ornament. Holly berries surround one red heart. Don't forget the teddy bears cuddling hearts. 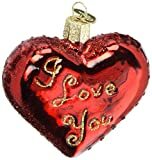 Children and women love these sentimental ornaments. Christmas ornaments are fantastic Christmas gifts, host gifts, even engagement gifts. You'll find them in all styles and in all price ranges. It really isn't obvious which heart ornament is under $10 and which one is over $100. Hearts are a symbol of passion in most cultures, not just Western. The symbol to the left is the Chinese character for heart. (It's pronounced shin by the way.) While it's a character in it's own right, it's also a character component that is used to make other Chinese characters. Just the way we use compound words such as heartfelt, heartwarming, heartache. When this character is included in another it's means that the character has a strong emotion or passion attached to it. 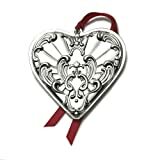 Lenox ornament designers have had a love affair with heart-shaped ornaments for years. 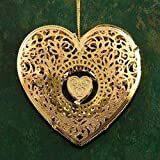 You'll find stunning gold heart ornaments, breath-taking silver heart ornaments, and stunning crystal heart ornaments. Not to mention a great selection of ceramic heart ornaments. In addition to the shape and the metals, you'll have lots of embellishments to choose from. Often they hang from bright red ribbons. Sometimes they'll have golden scroll work. You'll love the filigree hearts that let the light and Christmas tree peak through. If you're patriotic and want to display that pride on your Xmas tree - then the red, white and blue hearts will be your favorite. You'll even find patriotic hearts that include the flag pattern. I've shown you just a tiny sample of the hearts available on ebay to the right. There are hundreds more. Love has So Much to Say! 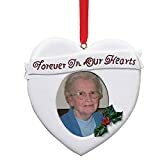 You can use a heart ornament to express grief for a person who is deceased. Give it as a gift and it provides emotional support to loved ones who miss the deceased person. Christmas holidays are a particularly difficult time. Of course bright read passionate hearts that scream I LOVE YOU are always perfect to express your romantic feelings toward someone. Attach a red heart ornament to Valentine roses and she'll have something to remember forever! The organic heart in the middle is perfect for a woman who loves both the traditional and the quirky. Perfect for the Autumn leaf peeper who can't get enough of the brilliant foliage colors. This is the Chinese character for love (say it like aye). Can you see the heart character in the center of it. Well if you take out the love character you have the Chinese character for accept, endure, or even suffer. So to accept or suffer with the heart is to love in Chinese. As you can see hearts are the language of many kinds of love, emotions, and passions. Give the gift of a heart and you give sympathy to the grieving, emotional support to the ailing, and romance to the swooning. Whether you believe that Christmas is the birth of Jesus who came to save us in the name of his father or a pagan holiday to celebrate the winter solstice, it is the perfect time to celebrate love.